The Geneva Declaration advocates the inclusion of the issue of armed violence prevention and reduction within the UN system. 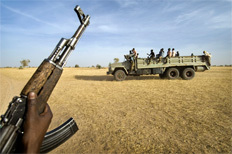 In 2008, Switzerland and 56 other sponsoring states introduced a resolution in the United Nations General Assembly (UNGA) on the issue of armed violence and development. On 17 November 2008, the resolution—‘Promoting Development through the Reduction and Prevention of Armed Violence’ (A/RES/63/23)—was adopted by consensus in the plenary session of the UN General Assembly under the agenda item ‘Follow-up to the Outcome of the Millennium Summit’. The resolution called on the Secretary-General to seek the views of the member states on the interrelations between armed violence and development. The UN Secretary-General’s report on 'Promoting Development through the Reduction and Prevention of Armed Violence' (A/64/228) was presented to the UN General Assembly on 16 November 2009. The Secretary-General recognizes that armed violence undermines development and constitutes an impediment to the achievement of the Millennium Development Goals. He defines armed violence as the intentional, threatened or actual, use of arms to inflict death or injury. He states that armed violence not only destroys lives, it also damages infrastructure and property, limits the delivery of public services, undermines investment in human, social, and economic capital, and contributes to unproductive expenditures on security services. The Secretary-General proposes the following recommendations: strengthen the implementation of existing global conventions and agreements; improve the effectiveness of armed violence prevention and reduction policies and programmes through investments in the production, analysis, and use of evidence; strengthen national and local capacities for armed violence prevention and reduction; develop measurable goals, targets, and indicators for armed-violence prevention and reduction; ensure that armed-violence prevention and reduction efforts are coherent and coordinated; increase resources for armed-violence prevention and reduction; build partnerships between sectors, between agencies, and with civil society; foster greater international action; and make a sustained commitment to promoting development through the reduction and prevention of armed violence.